For people that have been into mining for a couple of years already when it comes to mining rig frames there are not much secrets, they have already figured out what works best for their needs and have tweaked their designs a lot since the start. For people that are new or are just getting started with mining it is much easier to go for a readily available mining rig frame and add the hardware to it than to start figuring out the whole thing from the scratch. That is why we always love to check out some of these professional mining rig frames that have been improved and refined over time and are available for miners to help them get started faster and with better results by just adding the mining hardware. What we are going to be looking at now is one such product called BITMINE RIG-V6 (rev04) made by BITMINE.mn and available for sale. 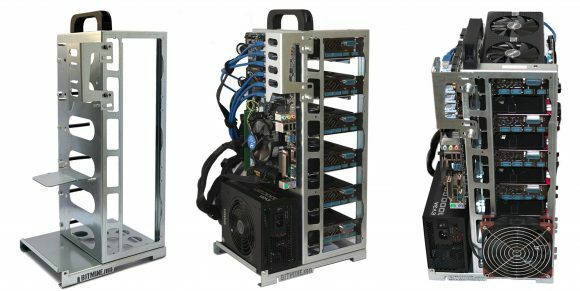 The BITMINE RIG-V6 (rev04) is a compact and easy to assemble and use mining rig frame for a single power supply and a up to 6x GPUs. It is a clever modular design that can easily be extended to 8x GPUs with an additional module and a second power supply, or up to 12x GPUs with a second frame. The price of the mining frame is 179 EURO for the standard version and there are discounts available for purchase of multiple units as well as for payment with crypto currencies (multiple supported). 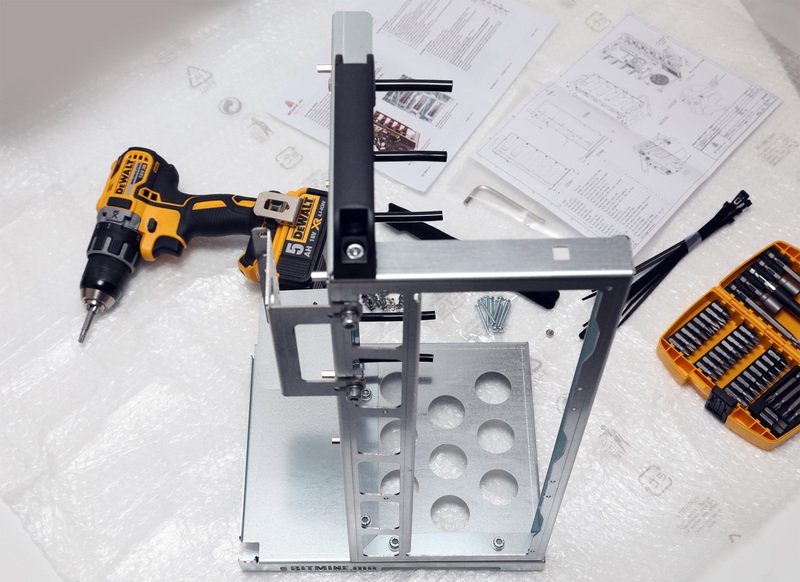 The frame comes mostly pre-assembled, so you will just need a few minutes until you are ready to start adding the mining hardware in it. The package contains all that you need probably besides a Philips screwdriver, though you probably won’t have trouble finding one of these at home anyway. 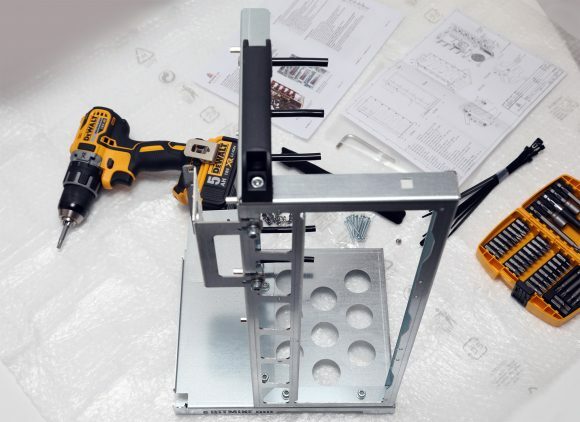 The mining frame has a lot of clever ideas implemented, so that you can quickly and easily add or remove hardware to it without the need of tools or at least without many tools for the most part. There is a handle on top to make thing easy to move the whole thing around, even with its pretty compact size it is still much easier with a handle. 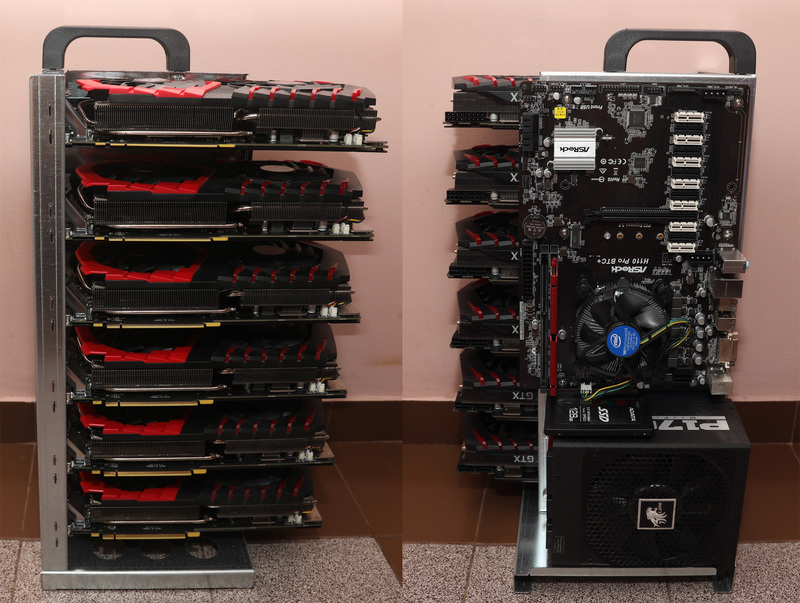 The GPUs are mounted with reusable plastic holders where the screws usually go and their backplane locks in place on the other side in the frame, and at the back is a plastic holder to keep the GPU stable in place. The design is planned for a 2.5-inch SSD drive that attaches to a plate that you clip on the main frame on top of the PSU, though you can still use an M.2 SSD or a hard drive and place it somewhere in the build. There is a metal holder available for the PCI-E risers to make sure they do not move too much and cause stability issues or GPUs disappearing on a random base due to bad contact. Originally the stand can work fine with GPUs at up to 150W TDP each, for more you would need to add extra cooling fans and the frame has space for three 140mm fans. The compact design means that the GPUs are pretty close to each other, but they are fine if they do not use too much power and the extra fans can help move the hot air better. GPUs with single turbine fan will probably work better as they direct the airflow better and help prevent the formation of hot air pockets, though video cards with two or three regular fans will work fine if their cooling solutions are not larger than two slots. More powerful in terms of performance and consuming more power GPUs with 2.5 slots or even lager coolers are pretty much not recommended for this mining frame as you would have a hard time properly cooling them. When you assemble all of the hardware, before you add all the cables things are looking pretty good and clean. 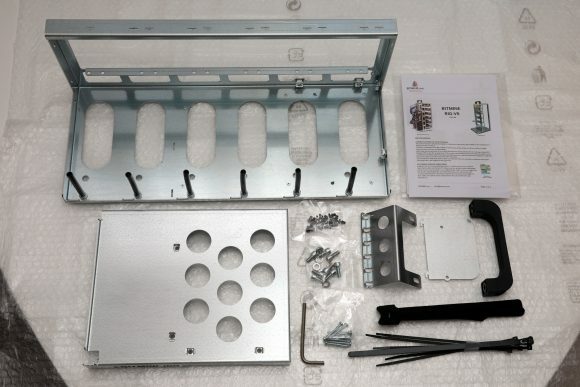 The assembly time is quite short as there is nothing hard attaching the motherboard, the PSU, the SSD and the video cards. The design of the frame makes sure that everything is easily accessible, so adding the cables should not be a problem at all, making sure things look clean and pretty after that, well that is an entirely different story. Then again cabling has always been the major problem when building not only mining rigs, but even when assembling a regular computer where you normally just have a single video card and much less power and other cables. When you get to the part where you connect the cables you will quickly see why the design of the frame is compact and why everything is made the way it is. You should not be using PCI-E risers with USB cables shorter than 60 centimeters, otherwise you might have trouble connecting everything. As for the power cables, the design with the PSU at the bottom should be just fine for pretty much all power supplies as far as the length goes, though if you add an extension module for 8 GPUs without a second power supply you might actually have issues with cable length. Cables are messy at first and you will probably need to spend some time figuring out what to go where for the best results, the good thing is that you get some Velcro and cable ties bundled with the frame to help you organize things a bit. Now for some potential issues and things that might use some improvement or at least you should be aware of to avoid them and get a workaround solution ready. The bracket holding the PCI-E risers to the motherboard works pretty well with both types of risers (straight up and angled USB connectors), though it may not work that great on all motherboards for various reasons. 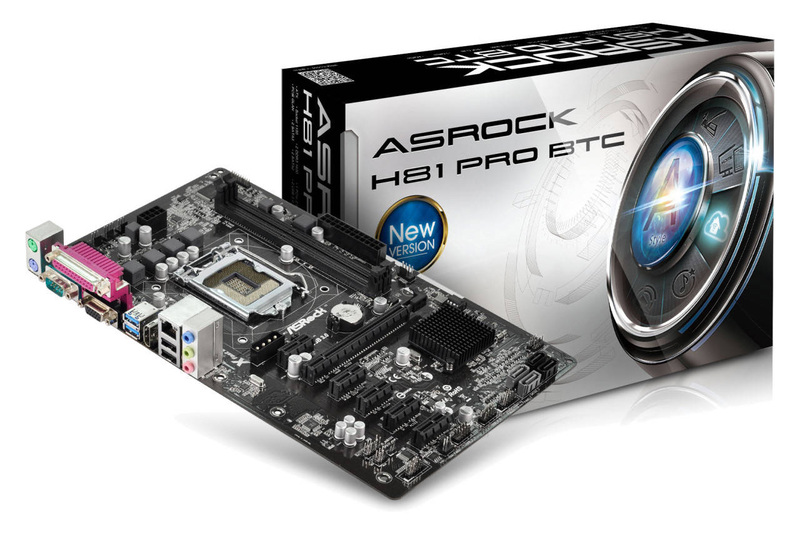 For example if you use a motherboard designed for more than 6 GPUs like the AsRock H110 Pro BTC+ you need to use specific slots and still the sixth PCI-E riser will not be held by the bracket. The same goes for other mining motherboards from Gigabyte or Asus and others that are designed for use with more than 6x GPUs, though with standard six GPU mining boards everything should be fine. If you are using a 2.5-inch SSD and place it on the supplied bracket that holds it on top of the power supply you may notice that the screws holding it might be angling the drive a bit as they touch the PSU, but the bigger problem is that the whole bracket that slides into the frame is pretty loose and that can cause possible issues if/when it detaches from the frame. 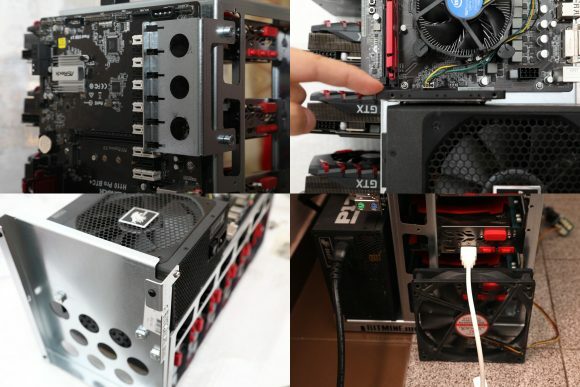 The feet of the whole frame may not be that great as well, there are four plastic holders used for the GPU attachment as well, but the problem is that they are very small and they take up all of the weight. If you place the frame on not so even surface it may be shaky and unstable as the contact surface is very small. Using rubber feet with larger surface area would to the job of insulating the frame from the ground and providing a more stable support, including even vibration dampening. The extra fans that you can mount on the back of the frame to improve cooling are nice and all, but since they come at the back of the cards you could have potential issue with a HDMI dummy that needs to be connected to a GPU on some motherboards in order for them to boot up or to switch display resolutions when remote controlling them (depends on OS, hardware configurations and so on). Not serious issues at all, just some areas that may use extra work and improvement and these can be done by the user assembling the mining frame with some clever ideas as well. Since the BITMINE RIG-V6 (rev04) is great for lower power GPUs such as AMD Radeon RX 470/570 or RX 570/580 as well as Nvidia GPUs such as GTX 1060, GTX 1070, GTX 1070 Ti, GTX 1080 and/or their respective mining editions we were more interested in what happens if you go for more powerful video cards. Our goal was to test especially with GTX 1080 Ti (250W+ TDP unoptimized) as well as RX VEGA 56/64 GPUs (210-300W unoptimized) and as one would expect things did not go that well with cooling these beasts properly. The main problem is the tight space between the cards that does not allow for high enough airflow, even with 3 extra powerful 140mm fans added to improve air circulation. If you optimize the power usage of the GPUs to about 200W or less you should be able to properly cool them down using extra fans, but at the cost of a noisier mining setup. With no power optimizations things are not going to be good, so essentially forget about using these powerful GPUs for mining with this rig unoptimized. Even with Optimized GTX 1080 Ti at 200W and three extra powerful 113+ CFM fans helping we still observed that the topmost video card is about 10 degrees cooler than the others, just because it has access to more cooler air and there are no hot air pockets forming like in the cards below. Our conclusion is that the BITMINE RIG-V6 (rev04) is a great design for a mining rig frame that you can use at home or in a small crypto mining location. It has clever design and is easy to assemble and use, has some really great features and is extensible to some point via additional modules. It works really well with mid to high-end GPUs, but we are not going to recommend it for the top models used for mining like AMD Radeon RX VEGA or Nvidia GeForce GTX 1080 Ti as they cannot really be properly cooled the way we like them to (though you can still try on your own risk). The BITMINE RIG-V6 (rev04) is priced decently, though if you buy more than one and pay with crypto you can get extra discount and a nicer price. So we do recommend that you check the BITMINE RIG-V6 (rev04) mining frames, they are produced and shipped from within EU (Italy), so there should be no extra taxes for delivery to any country inside the European Union. The only possible issue at the moment is the fact that the official website is only in Italian, so you can get into a bit of trouble ordering if you do not know the language, but with an online translator you should be fine in going through the order process. Update: We got a confirmation that the PCI-E riser holder and the SSD plate have been redesigned to resolve the potential issues we’ve mentioned, so you can count these as solved already if you order the mining frame now. Nowadays people are making multi-GPU mining rigs for mining crypto currencies from a lot of different materials – plastic, wood, aluminum frames and whatever they have handy. 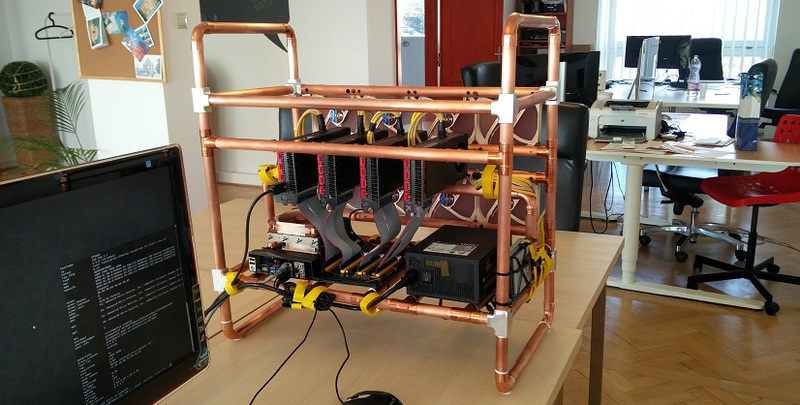 Peter Selmeczy however did go for an interesting approach with his GPU mining rig build – he went on using copper tubes to build his mining rig. Furthermore he has provided a detailed build of his project, so if you think that the idea is cool, you might want to take a look on how he built his rig. 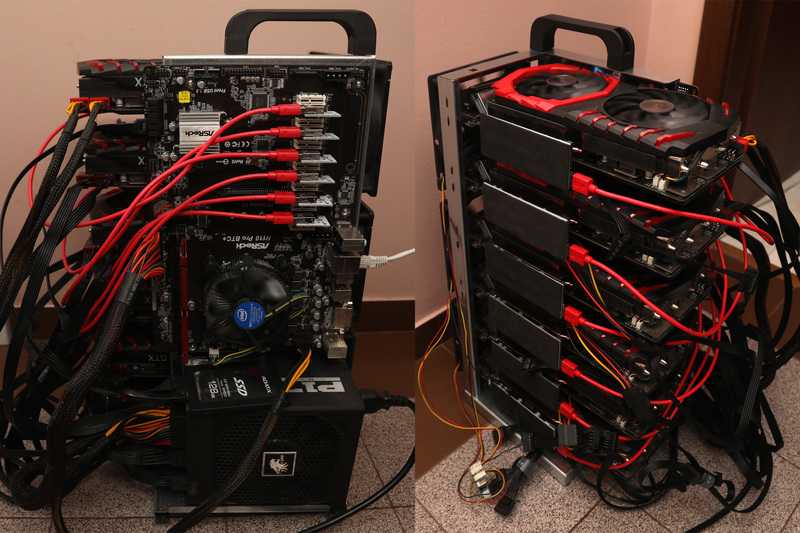 The 4 GPU mining rig he built was entirely made from copper tubes and aluminum joints for the tubes. It all goes together with 8 large 140mm Noctua fans for better airflow and the color of these fans does go along very well with the copper tubes, so the whole thing does indeed look really cool. Peter Selmeczy has started working on the second improved version of his built that will have all of the GPUs cooled using the Arctic Cooling Accelero Hybrid III water cooling system, 100% of the wiring passed through the copper tubes, the use of cable combs for the wires and have a significantly reduced size for the whole thing. So you might want to keep an eye out on the progress and how will version 2 of the open frame copper tube mining rig look like when it is finished. 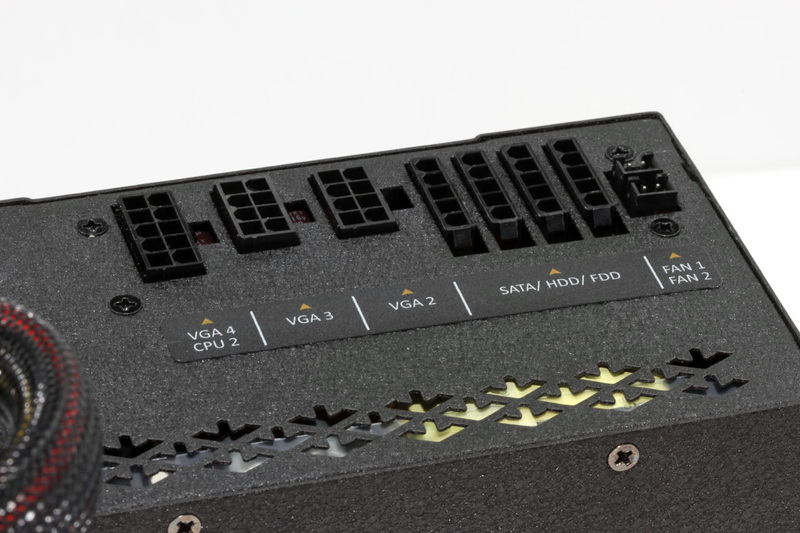 The first thing you need to ensure is that the power supply you go for has enough PCI-E power connectors available to power all of your video cards in the mining rig. So if you have 6 video cards getting six separate PCI-E power connectors from the power supply is the best solution. Unfortunately not many power supplies are designed with single cables for 6 or even more PCI-E power cables as normal computers rarely have more than 2 or up to 4 video cards in rare cases. Even if a power supply has let us say 8 power connectors these are usually double connectors going from a single wire to the PSU and this is originally designed for up to 4 video cards (if they have double PCI-E power connectors). Adding additional adapters splitting single PCI-E power connector to dual PCI-E or using Molex to PCI-E power adapter can cause problems, so if possible it is wise to try and avoid it. If not, then you at least need to make sure that you are not overloading any of the lines going to the power supply, the easiest thing to check for that is to touch the cables and if they are getting hot, then it is not Ok. If you are using a motherboard with multiple PCI-E slots like the AsRock H81 Pro BTC motherboard that is actually designed to be sued for GPU mining rigs you will need to use extenders. 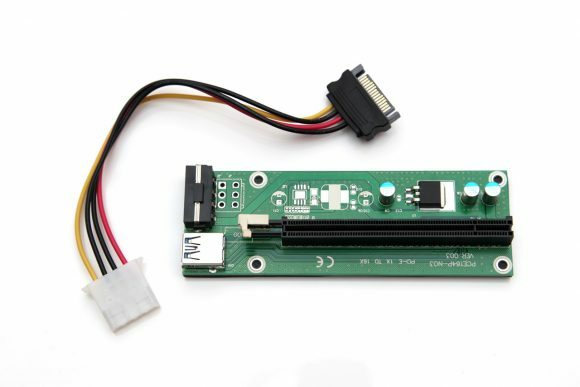 Although the motherboard has extra 4-pin Molex power connectors in order to properly power video cards that need more power from the PCI-E slot. Even in this case it is still better to go for powered PCI-E risers and do not try to draw more power through the motherboard, especially if you go for 6 GPUs. The x16 PCI-E slot that is normally being used for video cards on the motherboard is designed to provide up to 75W of power to the video card by specifications, though most of the consumption comes from the 12V line and there the max power is rated at up to 66W. If you however have 6 video cards that are maxing out the power draw from the motherboard it will come up to a pretty high number, even though in most cases video cards do not go with the maximum power that the PCI-E slot can provide them with. There are a number of different PCI-E risers, but one that is very popular choice is the x1 PCI-E to USB 3.0 riser as it is really well designed and works very good, unlike the case with not so well made ribbon cable extenders. These risers use a USB 3.0 cable, but they are not actually using USB interface, the cable is just a good choice for the data communication without issues. PCI-E risers like the one on the photo rely on 4-pin Molex power connector to supply any power that the video card may need, completely cutting any power draw from the motherboard’s PCI-E slot. We already know that the video card can draw up to 66W over the 12V line and this should normally not be a problem for a 4-pin Molex connector as these connectors are rated at 10-11A per wire and since there is just one 12V wire you should in theory be able to go for up to 120-132W over it, but that is only if you have a single Molex power connector. The actual problem with 4-pin Molex power connectors are not the connectors themselves, but the cables that are being used to route them to the PSU, because they also have a maximum power rating depending on their thickness. Power supply manufacturers and cable adapter manufacturers do not go for the best option as it would make things more expensive and in most cases it will not hurt to go for a thinner cable. To be able to get up to 10A current over a 4-pin Molex connector you would require a 14 AWG or 16 AWG wire, 18 AWG ones are rated at up to 8 Amps and 22 AWG wires are rated for up to 6 Amps. Unfortunately most manufacturers do not go for 16 AWG let alone for 14 AWG wires on Molex connectors (usually 16 AWG wires used on PCI-E power connectors on high-end power supplies). 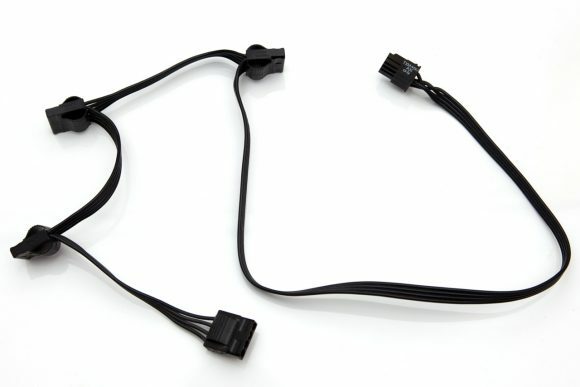 In most cases the power supply wires for the 4-pin Molex connectors are 18 AWG, though there are cases, especially for adapters or extenders where even cheaper 22 AWG wires are being used. If the maximum power draw for a video card over the 12V line of a PCI-E slot is 5.5A (66W) then even a 22 AWG wire rated at 6 Amps should be enough. It should, but only if you connect only one such 4-pin Molex power connector to a line going to the power supply. That is rarely the case however as power supplies normally have a couple such 4-pin Molex connectors on single line going to the power supply and that goes over a 18 AWG wires. In order to be safe a maximum two PCI-E extenders should be powered by such cables to stay within specs or at least close to them, but people often use three or even four of these connected and that can lead to cables overheating and melting or even burning and damaging your expensive mining hardware as a result. Normally with video cards that have external PCI-E power connector the maximum of 66W over the PCI-E slot is never reached, it will be more like up to 30-40W for example (or less), though there are exceptions as well – the reference design Radeon RX 480 GPUs. Even at 40W if you connect three or four of the 4-pin Molex power connectors that use a single cable line to the power supply, then you will still be over the maximum rating of the cables. What happens is the cables starting to heat up and as a result they may even melt and short out and that can do things like start a fire, damage your video cards, motherboard or power supply etc. The easiest way to discover such a problem is to just touch the power cables a few minutes after you have the mining rig up and mining, so that it is under heavy load and using a lot of power. Cables that are hotter to the touch than the others are probably near or over their limit and you should think of a way to reduce the power draw over the specific power line to the PSU. 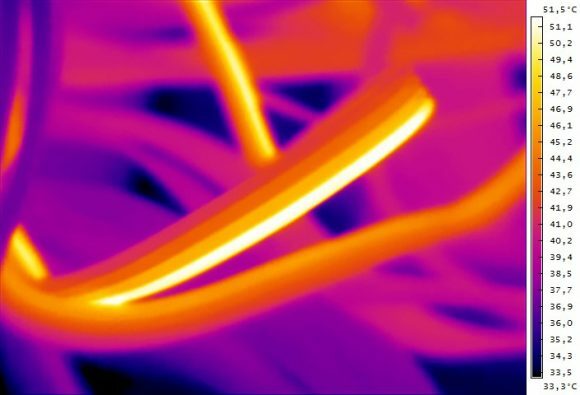 If you have a thermal camera you can just take an image like the one above and see the problem clearly and diagnose which cable might be overloaded and do something about it. But even if you don’t have extra tools to assist you, even just touching and noticing a hotter cable can be enough to find an issue with the power distribution of your mining rig. 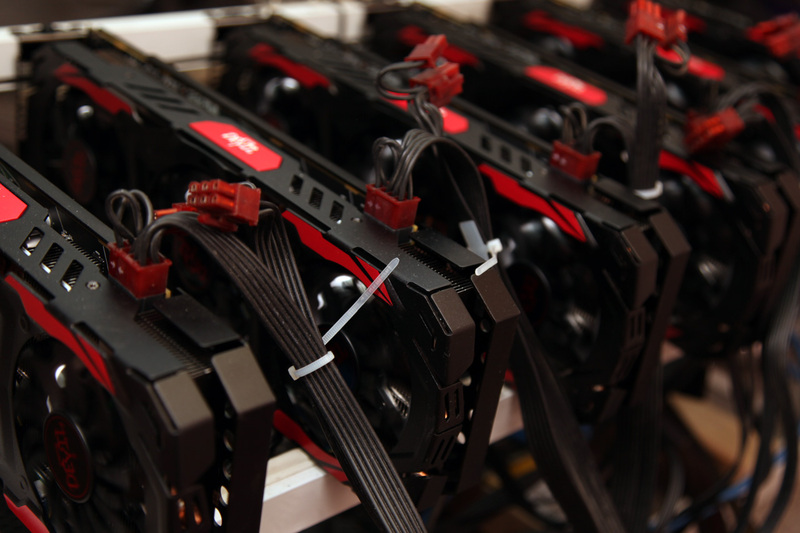 Do not overlook possible issues like that as later on they may cause you serious headaches and even cost you a significant amount of money, taking you on the red, instead of you actually making profit from mining.